Home » Academics » Schools » College of Arts, Humanities and Social Sciences » Faculty » Carolyn Y. Tubbs, Ph.D.
Carolyn Tubbs, Ph.D., is associate dean of the College of Arts, Humanities and Social Sciences and an associate professor and program director for the Marriage and Family Therapy Program at St. Mary’s University. She earned her master’s degree in Human Development and Family Studies at Texas Tech University and her doctorate in Child Development and Family Studies/Marriage and Family Therapy at Purdue University. Dr. Tubbs was a Postdoctoral Fellow with the Family Research Consortium III and a NIMH Research Scientist at Penn State University for Welfare, Children and Families: A Three City-Study, a multi-site, federally-funded ethnographic study on welfare reform. As part of her work, Dr. Tubbs has examined facilitators of family stability, family rituals, and parenting in low-income families. 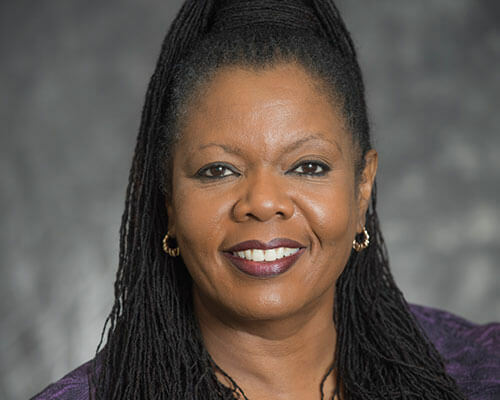 Dr. Tubbs has also been involved with the National Institute on Domestic Violence in the African American Community in researching the causes and solutions to domestic violence in African-American communities located in both urban and rural regions throughout the United States. Her research interests include qualitative research methodology, shared parenting among couples with a history of intimate partner violence, health care disparities, mental and physical health issues, and parenting in low-income populations. Currently, she is an associate editor for JMFT and a member of the Taos Institute. She also collaborates with the Institute for Family Services on social justice and liberation-based healing research. Dr. Tubbs is an AAMFT Clinical Fellow and Approved Supervisor, as well as a Licensed Marriage and Family Therapist (LMFT) and a LMFT Supervisor in Texas. Dr. Tubbs has been a family therapist for more than 20 years and Approved Supervisor for more than 13 years. 2017 – Distinguished Faculty Award – Graduate Faculty. St. Mary’s University–TX. January 2017. 2015 – Faculty Awardee, 2015 Alice Wright Franzke Feminist Award. St. Mary’s University–TX. March 2015. 2013 – Nominee, 2013 Felix Berardo Award for Mentoring, National Council on Family Relations. 2005 – Nominee, 2005 Rosabeth Moss Kanter Award for Excellence in Work-Family Research. Roy, K., Tubbs, C. Y., & Burton, L. (2004). Don’t have no time: Daily rhythms and the organization of time. Family Relations, 53, 168-178. 2002 – Postdoctoral Fellow, National Institute on Aging, Penn State University, University Park, PA. June 2002–July 2004. 1999 – Postdoctoral Fellow, Family Research Consortium III, Chicago, IL and Penn State University, University Park, PA. June 1999–May 2004. Davey, M., Davey, A., Tubbs, C., Savla, J., Anderson, S.R., & Janke, M.C. (2012). Second order change and evidence-based practice. Journal of Family Therapy, 34 (1), 72-90. Almeida, R., Hernandez-Wolfe, P., & Tubbs, C. Y. (2011). Cultural equity: Bridging the complexity of social identities with therapeutic practices. The International Journal of Narrative Therapy and Community Work, 3, 43-56. Davey, M. P., Tubbs, C. Y., Kissil, K., & Nino, A. (2011). “We are survivors too”: African American youths’ experiences of coping with parental breast cancer. Psycho-Oncology, 20, 77-87. Davey, M. P., Kissil, K., Nino, A., & Tubbs, C. Y. (2010). “They paid no mind to my state of mind”: African American breast cancer patients’ experiences of cancer care delivery. Journal of Psychosocial Oncology, 28, 683-698. Kissil, K. Nino, A., Jacobs, S. Davey, M., & Tubbs, C. Y. (2010). “It has been a good growing experience for me”: Growth experiences among African American youth coping with parental cancer. Families, Systems, & Health, 28, 274-289. Tubbs, C. Y. (2010). African American women’s perspectives of shared parenting after dissolution of a violent relationship. Journal of Feminist Family Therapy, 22, 130-152. Mitchell, M. B., Kuczynski, L., Tubbs, C. Y., & Ross, C. (2010). We care about care: Advice by children in care for children in care, foster parents, and child welfare workers about the transition into foster care. Child and Family Social Work, 15 (2), 176-185. Tubbs, C. Y., Roy, K., & Burton, L. (2005). Family ties: Constructing family time in low-income families. Family Process, 44, 77-91. *Roy, K., Tubbs, C. Y., & Burton, L. (2004). Don’t have no time: Daily rhythms and the organization of time. Family Relations, 53, 168-178. *This article was selected as one of the top 20 nominees for the UUUU2005 Rosabeth Moss Kanter Award for Excellence in Work-Family ResearchUUUU. The award is given to the author(s) of the best research paper published during a given year. Tubbs, C. Y., & Rosenblatt, P. C. (2003). Assessment and intervening with Black-White multiracial couples. Couple & Relational Therapy, 2, 115-129. Tubbs. C. Y. (2016, November). Healing practices in social work and mental health. Invited discussant to the Liberation-based Healing Conference 2016, Silberman School of Social Work at Hunter College, New York, NY. Tubbs. C. Y. (2016, October). The same argument over time: Addressing stress in family relationships. Invited keynote presentation to the Texas Association of Community Mental Health Centers, Laredo, TX. Almeida, R. & Tubbs, C. Y. (2016, April). Social justice in MFT: Addressing racial disparity and healing in our communities. Keynote address and conference presenters. 2016 Missouri Association for Marriage and Family Therapy, Wildwood MO. Tubbs. C. Y. (2015, June). Shared parenting among estranged couples with a history of intimate partner violence. Invited presentation to the San Antonio Association for Marriage and Family Therapy, San Antonio, TX. Tubbs, C. Y. (2011, April). Working beyond stereotypes: The Cultural Context Model and working with families of color. Invited presentation at the Council on Contemporary Families Conference, Chicago, IL. Tubbs, C. Y. (2010, April). Shared parenting among estranged African American couples with a history of intimate partner violence. Invited presentation at the Council on Contemporary Families Conference, Chicago, IL. Tubbs, C. Y. (2009, October). Current Models of Practice: Cultural Context Model. Panel presentation at the 4th annual Liberation Based Healing Conference, Lewis and Clark University, Portland, OR. Elanbari, G. & Tubbs, C. Y. (2016, March). Translation and validation of the Arabic-Revised Dyadic Adjustment Scale. Paper presented at the 2016 International Family Therapy Association, Kona HI. Haque, A., & Tubbs, C. Y. (2014, November). An exploration of salient stressors experienced by Muslims living in the United States. Paper presented at the 76th annual meeting of the National Council on Family Relations, Baltimore, MD. Gabel, S., Prinsloo, S., Lyle, R., Tubbs, C., Wilkens, N., Garcia, S., Rosenthal, D. & Cohen, L. (2014, Oct.). EEG neuroimaging and social support in head and neck cancer patients experiencing radiotherapy pain. Paper presented at the 11th International Conference for the Society for Integrative Oncology, Houston, TX. Almeida, R., & Tubbs, C. (2010, Oct.). Transformative family therapy. Paper presented at the 69th annual meeting of the American Association for Marriage and Family Therapy, Atlanta, GA.
Tubbs, C. Y., Jacobs, S., & Burton, L. (2010, May). Understanding family systems of violence in low-income families. Paper presented at the Sixth International Congress of Qualitative Inquiry, Urbana-Champaign, IL. May 2010. Dressner, L., Almeida, R., & Tubbs, C. (2010, May). Culture in action: just therapy in a just society. Workshop presentation at the annual meeting of the National Association of Social Workers-New Jersey, Atlantic City, NJ. Almeida, R. V., Hernandez-Wolff, P., & Tubbs, C. Y. (2010, Mar.). Cultural equity in action. Paper presented at the Networker Symposium, Washington, DC. Tubbs, C. Y., & Almeida, R. V., & Lockard, J. (2009, Oct.). Transformative family therapy: The Cultural Context Model. Paper presented at the 68th annual meeting of the American Association for Marriage and Family Therapy, Sacramento, CA. Tubbs, C. Y., Lockard, J., Zelt, S., & Rubenstein, I. (2009, May). From critical consciousness to action: alliance for racial and social justice’s participatory action research. Panel presentation at the Fifth International Congress of Qualitative Inquiry, Urbana-Champaign, IL. Almedia, R & Tubbs, C. Y. (2009, May). From cultural competence to cultural equity. Workshop presentation at the annual meeting of the National Association of Social Workers-New Jersey, Atlantic City, NJ. Tubbs, C. (2008, May). Ecological, Participatory Action Research: Re-visiting Strategies and Outcomes. Panel presentation at annual meeting of the International Congress on Qualitative Research, Urbana-Champaign, IL. Almeida, R., Carranza, M., & Tubbs, C. Y. (2007, June). Reflections of trauma: multiple borders crossed by domestic violence in families: Women, children and immigration. Panel presentation member at the annual meeting of the American Family Therapy Academy, Vancouver, BC, Canada. Tubbs, C. Y. (2005, November). Promoting the safety of women and their children when women separate from violent partners. Panel presentation at the annual meeting of the National Council on Family Relations, Phoenix, AZ. Tubbs, C. Y. (2005, June). Older women’s perspectives of shared parenting after intimate partner violence. Paper presented at the annual meeting of the American Family Therapy Academy, Washington, D.C.
Tubbs, C. Y. (2004, November). Co-Parenting after abuse: Women’s perspectives on parenting with an abusive ex-partner. Paper presented at the annual meeting of the National Council on Family Relations, Orlando, FL. Tubbs, C. Y. (2003, November). Family ties: Constructing time in low-income families. Paper presented at the annual meeting of the National Council on Family Relations, Vancouver, BC, Canada. Tubbs, C. Y. (2003, July). Qualitative methods and family therapy. Paper presented at the annual meeting of the American Family Therapy Academy, Miami, FL. Tubbs, C. Y. & Moten, C. P. (2002, November). Problem definition and treatment seeking behaviors by low-income caregivers concerned with child mental health. Paper presented at the annual meeting of the National Council on Family Relations, Houston, Texas.